The farm produces four main products – wheat, rapeseed, field beans and oats. Most of our wheat leaves the farm on large lorries, headed for large commercial mills to make your sliced loaf. A small amount of wheat is milled on farm to make our Strong Wholemeal flour. It has no additives and makes a tasty loaf, particularly as soda bread. Crusoe, Edgar, Solstice, Gallant, Skyfall and Trinity are the varieties of wheat grown for bread making on the farm, but we also use our flour for crumble, muffins, fruit cakes, and even pancakes! 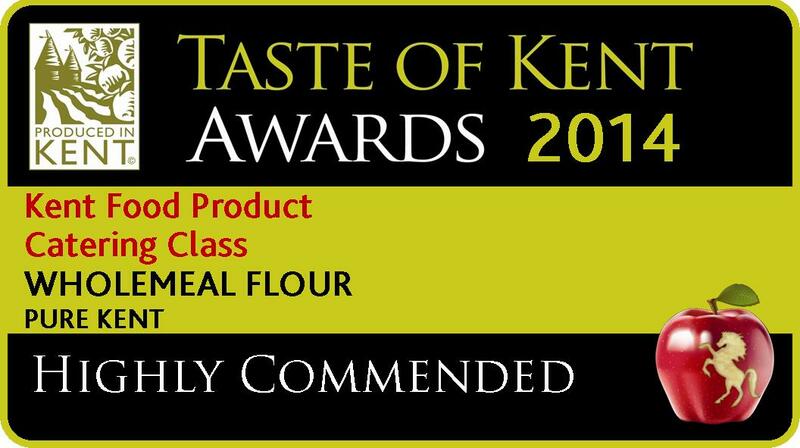 Pure Kent Strong Wholemeal Flour was awarded 2 Stars in the Great Taste Awards 2014. Great Taste, organised by the Guild of Fine Food, is the acknowledged benchmark for speciality food and drink. It has been described as the ‘Oscars’ of the food world and the ‘epicurean equivalent of the Booker prize’. The judges said our flour made the “perfect loaf” with a “fresh, earthy flavour”. We put this down to the fact that we generally mill to order – we don’t mill large batches and store it. Our bakers often enjoy their flour within 24 hours of milling. And we don’t add anything at all, no preservatives, no dough improvers and no fortificants. Pure Kent Strong Wholemeal Flour was also judged as Highly Commended by the judges in the Taste of Kent Awards 2014. The judges were presented not only with flour, but also with three loaves of bread, two cakes and apple crumble! In 2014 we started producing a seived wholemeal flour, Coarse White Wheat & Barley flour. Our wheat is mixed with a small amount of barley, and stoneground. But we close the wholemeal chute on the mill and open the chute to the seive. Small particles of bran remain in the flour, but most is seived out. This flour won 1 Star at the Great Taste Awards in 2016. Our flour is available in 12kg sacks for local craft bakers, and also in 1.25kg window bags. Cold pressed rapeseed oil is a versatile oil, which has many uses in the kitchen. It can be used at low temperatures in salad dressings, pesto, and dunking. It can be used at higher temperatures, in cakes and muffins, and also at very high temperatures, for instance, stir frying and shallow frying. It makes amazing roast potatoes! Cold pressed rapeseed oil is one of the healthiest oils you can use in your cooking, with only 5% saturated fat and a good content of omega oils, which are essential in your diet. For more information about the health benefits of rapeseed oil, try the Rapeseed Oil Benefits web site. Our Cold Pressed Rapeseed Oil is available in 250ml glass bottles, 500ml glass bottles, 2.5litre, 5litre and 25litre plastic containers. Also in 800litre pallets. We also make flavoured oil by adding a few drops of natural essence. Our Garlic Cold Pressed Rapeseed Oil is very popular at food fairs, and our Mild Chilli makes a good gift for the chillihead in your life! Our Oak Smoked Rapeseed Oil is available in 250ml, 500ml and 5litre containers and is expertly smoked by an award winning smokehouse. As our rapeseed oil has a very high burn point, it’s great for making Yorkshire puddings. They don’t stick at all! Choose our oil for greasing pastry tins – your pastry will not stick and will go nice and brown – ideal for aspiring Bake Off contestants everywhere! Use rapeseed oil in cakes to help them stay fresher longer, and get that saturated fat content down. Use our oil when browning meat – it gives your meat and chicken better colour than other oils in our experience. Our flours can be used in your breadmaker, at around 1/3rd to 2/3 of the flour content, so mix it with strong white flour. If you are looking for cake and muffin recipes that use wholemeal flour, try a Glycaemic Index cook book. Both our flours are suitable for the wet-into-dry cake making method. 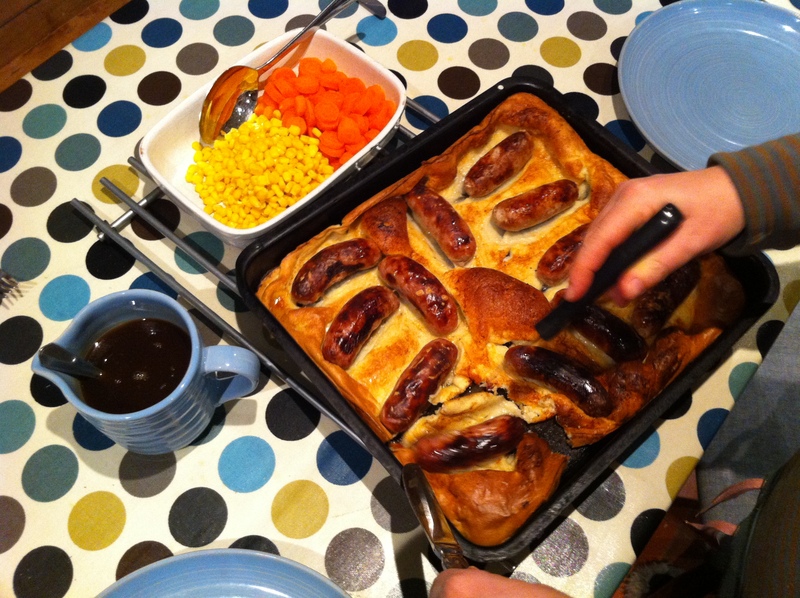 Toad in the Hole, using Cold Pressed Rapeseed Oil. Dijon & Black pepper – my personal favourite! The Lemon version is nice on left over roast chicken, or perhaps on cold new potatoes. The Dijon & Black Pepper one is nice as a side sauce with steak, and on mushrooms. Have you thought about growing Spelt for flour? Doves sold out in about eight months last year and Shipton Mill cleared all their stocks. I grew wheat commercially for 35 years but can’t eat it as I have an intolerance to wheat gluten. Spelt is ok with me, makes wonderful bread and cakes and also pastry with a slightly different technique. Also for coating meat in casseroles etc. I know many people who are avoiding wheat and are taking to spelt.